TBTI member Kurt Korneski, associate professor of history at Memorial University of Newfoundland will be releasing his newest book Conflicted Colony on October 1st 2016. Conflicted Colony explains processes of state formation in Newfoundland through a reassessment of key events in the country's history. 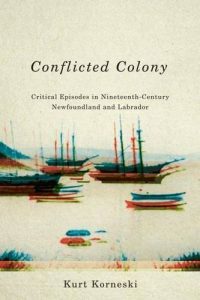 Korneski closely examines five conflicts from the late nineteenth century such as the Fortune Bay Dispute of 1878, the St George's Bay Dispute of 1889-92, the 1890s Lobster Controversy, the Battle of Foxtrap, and disputes over salmon grounds in Hamilton Inlet, Labrador. These events show how local regimes received, challenged, and reworked formal and informal diplomatic and commercial arrangements, as well as policies set out by the colonial and imperial government. Conflicted Colony is now available for pre-order on Amazon.